At Danny’s, it hasn’t always been about the steak. When Danny’s Italian opened in Red Bank in 1969, Danny Murphy served pasta and pizzas, preparing food inspired by his family’s history in the restaurant business. Fast forward two decades, and Italian food was everywhere in the borough. “I thought, there’s so many Italian restaurants,” Murphy said, “let me turn it into something else. So he took a year to learn everything he could about great steaks. “I went to every steakhouse in New York and every purveyor,” he said. “Most diners could never imagine what it takes to obtain and serve truly great steaks. That’s why it took a year to do the research. That was in 1989. These days, Murphy’s menu includes grass-fed rib-eyes and New York strip steaks from New Zealand, grilled filet mignon and rib eye; a dry-aged Porterhouse, and chateaubriand for two. The steaks are served alongside roasted garlic mashed potatoes, a baked Idaho potato, sweet potato fries or steak fries, and steamed broccoli. 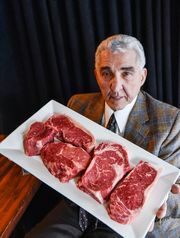 “The steaks are everything today, from dry-aged to grass-fed to a great choice of prime cuts,” said Murphy, who has rigorous standards for his suppliers and doesn’t hesitate to send a steak back if it doesn’t meet them. “They age the meat and cut it to my specifications, and the bottom line is if it’s not great, they get it right back,” he said. Murphy said his filet mignon is the most popular steak he serves, followed by the rib-eye then the grass-fed offerings. When it’s time to order, Murphy encourages diners to go for rare — if they can handle it — or medium rare, to truly enjoy the flavor of the meat.